Our most sought after inspections at the moment are our: 'Walk through' we walk through the premises with you to identify maintenance work required. Allow at least 3 Hours & we provide assessment sheets (11 pages) to follow based on the Australian standard for building inspections. 'Pre purchase' Thorough Scrutiny Inspection to Australian Standard AS4349.1 - 2007. This can take up to 4 hours. We Provide up to 30 pages of detailed report on the features inspected. 'Swimming Pool Safety Feature Scrutiny' Section 71AA of the Development Act seeks confirmation that Prescribed Safety Requirements of a swimming pool are met. With our accreditation under the Act you are safe in the knowledge of a professional scrutiny. 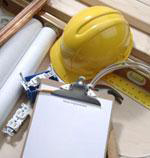 We provide a pamphlet, defect notification and a certificate of compliance. You may like to contact an inspector to clarify parts of your report, if so this is at no cost. Just give us a ring on the phone numbers below or through the contact page. Structural soundness - We inspect the structural integrity of a building against industry standards. Special purpose report - for the purpose of determining damage, cause and rectification work required. Structural engineers are used to determine the point of failure in components of a building and ensure that doesn't happen. Our structural engineer can provide on the site direction if you need it but that will cost a little more. Just give us a ring on 1300 860 272 or mobile 0417854163. Limit of liability: $1m any one claim and $2m in the aggregate. We are Licensed and members of building organizations and promote good building practice at every opportunity. We are professionals and have you protected in the event that we provide an inspection and written report and an unforeseen issue occurs that we should have known about. All our reports follow the Australian Standard and we use the Building Code of Australia and Reciprocity agreements between states on Tolerances and standards.